This air rig is a SLP (Super Low Pressure) Air Rig. This system incorporates a robust single regulator that allows you to adjust your PSI with the ease of twisting a knob or you can lock it out with slight modification to the regulator knob. 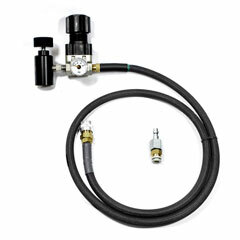 Please note, this air rig can NOT use any HPA tank that outputs higher than 300 PSI! SLP tanks are required! This system is able to work with any SLP regulated HPA tank. This means that the tank must output at a pressure of 300 PSI or lower. Most typical HPA tank regulators output anywhere from 600-800 PSI. This lower HPA Output does not affect the performance of your gun since it requires well under 300 PSI of input. As a mater of fact, this means that your PSI needs to be stepped down less to be at an acceptable level (120PSI or less). These air rigs are equipped with our state of the art airline, which is a large bore line for your PolarStar that is both flexible and durable. It is enclosed in a nylon sheathing that will not affect it's flexibility but will help protect it from damage.